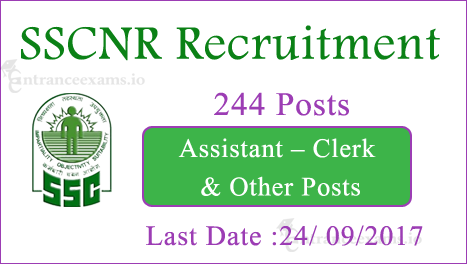 1.5 How to Apply for SSCNR 244 Chemical Assistant Jobs @ sscnr.net.in? Latest Job Openings in SSC Northern Region 2017: The SSCNR Recruitment 2017 Notification issued recently for the filling 244 Scientist Assistant, Chemical Assistant, UDC Posts. Interested and eligible candidates can fill the SSC NR Online Application before 24th September 2017. Read the official SSC Northern Region Notification 2017 @ www.sscnr.net.in for the Eligibility, Pay Scale, etc. Check the below sections for the SSC NR Recruitment 2017 Apply Online Steps. Are you searching for the Job Vacancy in Staff Selection Commission? If Yes, then you have landed on the right page. Here, we brought some valuable information which helps to enhance your career in a bright way. The Staff Selection Commission, Northern Region released the notification for the recruitment of talented persons for filling 244 vacancies. Hence, willing candidates have to hurry up and should ensure their eligibility for the SSC NR Jobs 2017. Individuals who finished 10th Standard and Graduation with minimum qualifying percentage from the recognized board can apply for the SSCNR Vacancy 2017. Aspirants who satisfy eligibility can participate in the SSC Northern Region Recruitment 2017 without any doubts. The Staff Selection Commission will receive the SSCNR Clerk Chemical Assistant Recruitment 2017 Online Application before 24th September 2017. From this post, you will get the overall information of SSCNR Scientific Assistant Recruitment 2017. So, go through the following sections. For Conservative Assistant Posts: Aspirants who have completed the 10th class, diploma in civil engineering with 3 years of experience are preferable. For Technical Assistant: Bachelor’s Degree in Hindi, Economics from a recognized University. Refer the official SSC Northern Region Notification 2017 for the post wise Educational Qualification Details. Aspirants have to take a glance at the above table for the detailed age criteria. The postulants of the SSCNR Recruitment 2017 will be selected on the basis of the following rounds. For General & OBC Candidates – Rs.100/-. For Women/SC/ST/Ex-serv/PHC – No fee. Applicants have to pay the application fee through SBI Net Banking, Credit Cards, Debit Cards, SBI Challan. The selected individuals will receive the best pay band of Rs. 9300-34800/- and a grade pay, other allowances as per the organization. How to Apply for SSCNR 244 Chemical Assistant Jobs @ sscnr.net.in? Visit the official website i.e., www.sscnr.net.in or ssconline.nic.in. Else, click on the below direct link. Refer the Staff Selection Commission Northern Region Notification 2017 to make sure your eligibility. Then, click on the “Apply Online for SSCNR Recruitment 2017” link. Enter all the required details, upload the signature & photograph. Pay the application fee if necessary through SBI. Finally, take the print out of the Staff Selection Commission, NR 2017 Application form and post it to the following address. Online Application Starting date: 25th August 2017. End date to apply online: 24th September 2017. Closing date for fee payment: 3rd October 2017. Hope, you get all the details of the SSCNR Recruitment 2017. If you need any other details, refer the Staff Selection Commission NR Notification 2017. Keep in touch with this www.entranceexams.io website for the latest updates from staff selection commission.